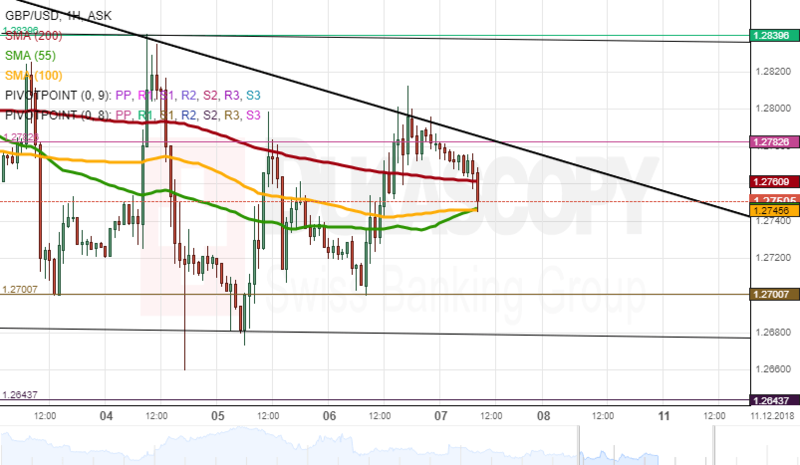 The British currency on Thursday found support in the pivot point at 1.2700 and surged through various simple moving averages to reconfirm the upper trend line of the large scale descending pattern near 1.2800. By the middle of Friday's trading session the GBP/USD was retreating downwards from one support level to another. The pair was expected to pass the support levels at 1.2750 and decline down to the 1.2700 level. Afterwards, the lower trend line of a medium scale pattern near 1.2680 should be approached. Meanwhile, note that any of the support levels might stop the decline. Moreover, the Brexit news still highly impact all of the GBP pairs causing sudden swings up and down.